After a good dose of depressing Russian literature, I was in the mood for something a bit more comforting. 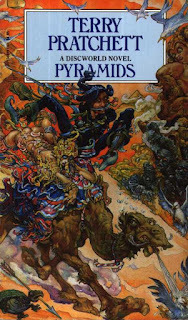 As such, here comes another Discworld review! It was going to happen eventually, especially with my husband encouraging me to pick up the series again. 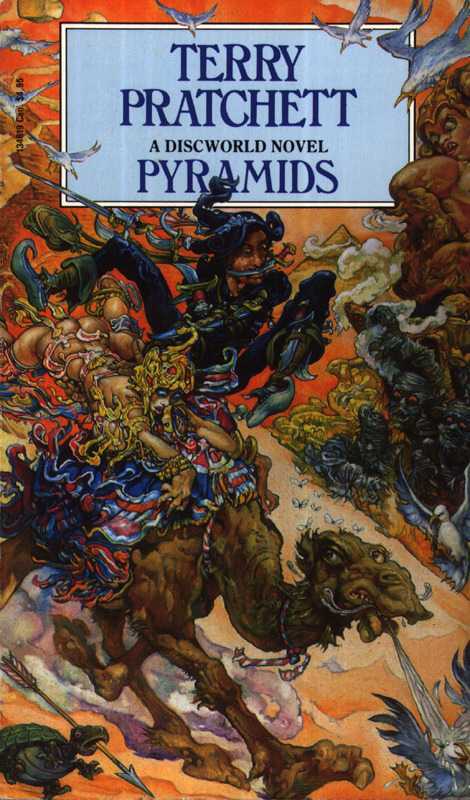 As a young boy, the prince of Djel is sent to Ankh-Morpork in order to learn how to be an assassin, and possibly earn back some of the money that their ancestors spent on building pyramids. Upon completing his assassin training, the prince Teppic is called back to his home country to take on the role of King. In attempting to be a good and progressive monarch though, he is foiled at every turn by the traditional High Priest Dios. And in the necropolis, the pyramid that is being built for his father's mummified body is starting to cause strange, possibly quantum, phenomena. I found Pyramids to be kind of average actually. Now don't get me wrong, Pratchett is his usual very funny self, with some truly awful names cropping up and barely a page going by without the writing eliciting a laugh or a smile of some kind. And there is a lot about it that is quite clever and interesting in regards to the world-building. I just can't get excited by the main character. I really wanted to like Teppic, and in the first part of the book I honestly thought that he could be a quirky main character who would be a joy to follow. I mean, his first appearance is him getting ready for the final exam that will allow him to join the Assassin's Guild in Ankh-Morpork; having strapped on everything that he can think of to help him, he falls over from the sheer weight of it. The parts where Teppic gets to show off his assassin skills are by far the best part of it, but for maybe two thirds of the narrative he doesn't get to use it. Instead he sits around while his country is run without him even being necessary, which, while frustrating in-character for him as well, isn't exactly what I was hoping for out of a main character. In addition, it means that when he clashes with Dios, to the point where the High Priest is actively threatening to kill him, the fact that Teppic doesn't automatically go to kill his obstacle is kind of bizarre. I suppose that there may be some Assassin Guild code that I'm missing involving only inhuming people under certain circumstances, but even so. What's the point of making the main character an assassin if he never actually inhumes anyone directly?